First irritating Blog moment. Typed 200 words or so, saved it normally, and tried to publish, and it just disappeared !! Call the police. What I was saying, was the series is contested by two v average teams, who have various members in decline/doubtful form. I think the series will be v competitive, with no dominance by either side, which will hopefully provide some decent trading opportunities. To make the Trading excercise meaningful, although I am hoping the markets on the Ashes will be v liquid, I will restrict myself to a bank of £20k per test. 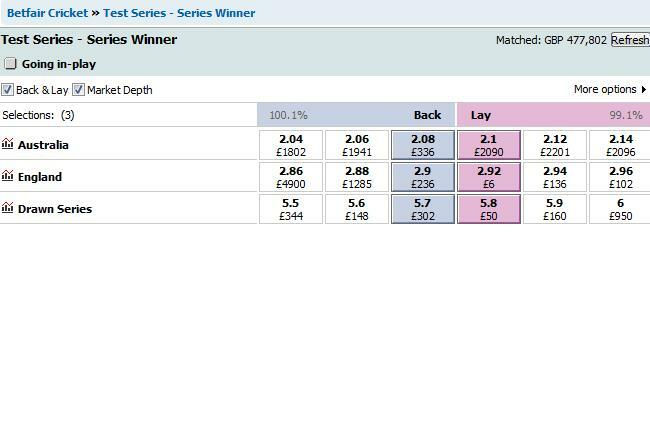 I will roll profits into the bank, but, if I say, lose £8k on test 1, I will restrict myself to £12k for test 2. The series is off to a flying start, with Strauss winning the toss, and leaving England 1 down, after a few balls. Eng battled back , to 190-4, before collapsing to 260 all out. The major wkt taker – Siddel – which may say a bit about the Aus attack. Prices went as high as 3.2 Aus, as low as 2.7 The draw, and 2.9x Eng. At close of play, Aus 25-0.
some showers forcast, but not enough to force a draw. Think Eng are a biggish price, hoping for wkts, first session Day 2. Got small book for now. At close of play, Day 2, Aus 220-5, 40 behind Eng score. Hussey has dug Aus out of a big hole, and it will be key to see what he finally gets. I have big bets, on him being top runscorer for series. I have v aggressive book, on Eng, at avg 18/1. End of Play, Day 3, Eng 19-0, 200 behind. I have, what is known in the trade, as a ‘Eamon Andrews’. This is an abbreviation, for his ‘Big Red Book’, which he used to roll out on ‘This is your life’. That may be funny, but the way Eng played today, was distinctly not. They were unlucky first up, but the bottom line is, they allowed Aus to score at least 100 too many. Despite this, I still hope they may salavage something. I am distinctly unimpressed by Siddel/Johnson/Hillfy, and sort of tthink/hope, Eng will score 400, to set Aus 200, on the last day. Close of play, Day 4. Play starts at 9.45 tomorrow, which is 15 mins early. Seeing as they went off for bad light, 30 mins early today, and tomorrows forecast is worse than todays, I can see no more than 80 overs being bowled. In my view, this will be a bore draw. I am not sure, Strauss will declare, prefering to tire the Aus bowlers. I am distinctly unimpressed by Aus, and have some series thought, in another blog. This entry was posted in Betfair and tagged Ashes, Australia, Betfair. Bookmark the permalink.